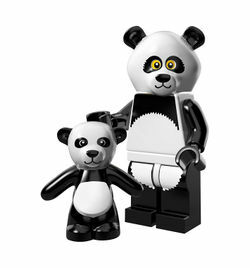 Panda Guy is one of the characters in the 2014 film, The LEGO Movie. He is the sixth minifigure in an animal costume, the others being the Gorilla Suit Guy, the Lizard Man, the Bunny Suit Guy, the Chicken Suit Guy and the Bumblebee Girl. This page was last edited on 9 January 2016, at 23:24.